No matter what kind of business you decide to open, it’s very important that you know exactly how you’re suppose to run it. This is especailly true if you’re going to open a business that requires a lot of management such as a self-storage business. You can also read accounting consulting business plans. This means that you’re going to need something that will tell you just what it is that you need to in order for your business to become a success. 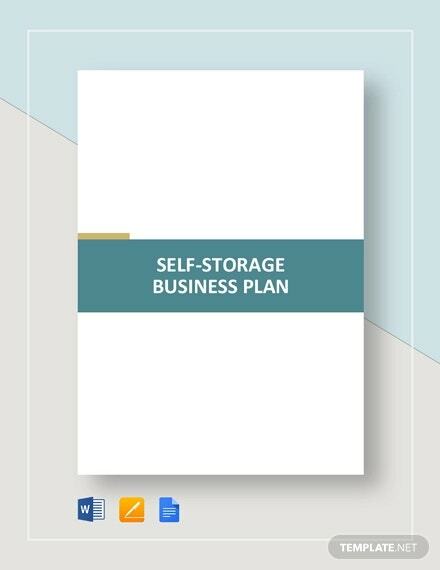 Which is why this article is going to teach you all that you need to know about how you can create a self-storage business plan that should be albe to do just that. What Is a Self-Storage Business? 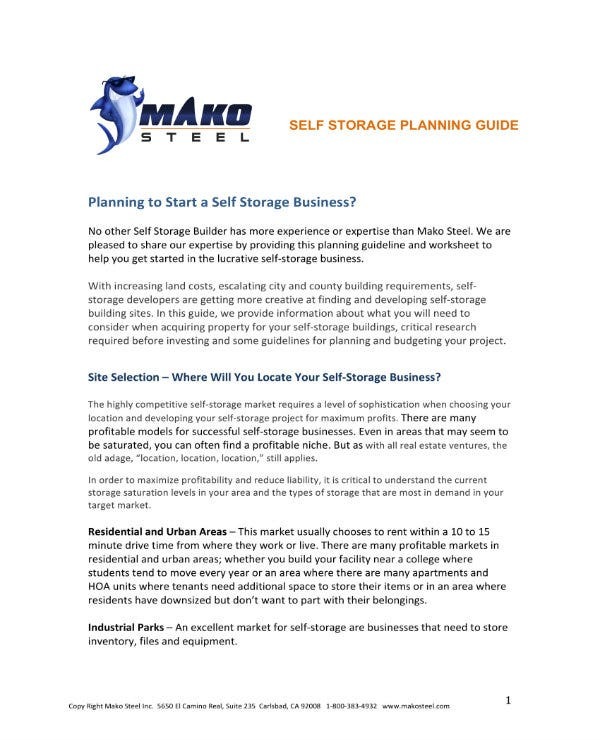 Before we get into making the plan, we must first understand what self-storage business is. It’s basically one that rents out storage space to tenants or inquirers that would like to use them. While there are some that rent out these spaces for residency, nearly all jurisdictions prohibit that from happening. Depending on the type of items you allow to be stored, people can generally place just about anything that they want into the spaces that they decide to rent. You can also read effective consulting business plan. As for how long they’re rented out, that’s usually around a month-to-month basis, but then there are those businesses that offer long-term leases. There are some self-storage businesses which offers insurance for purchase, but the lessor can also purchase his or her own insurance for whatever items are placed inside the storage space. And unlike warehouses, employees of the self-storage business do not have casual access to each storage space that has been rented out. A self-storage facility does not take possession or control of the contents of the space unless a lien is imposed for non-payment of rent. You may also see HR consulting business plans. Now that you’ve learned what a self-storage business does, the next step is to come up with the sample plan that will help you run the one you want to open. Remember that the entire point of having the plan is so that it can point out what you should be able to achieve, what you have to do in order to achieve it, and how your’e going to get people to know that your business exists. 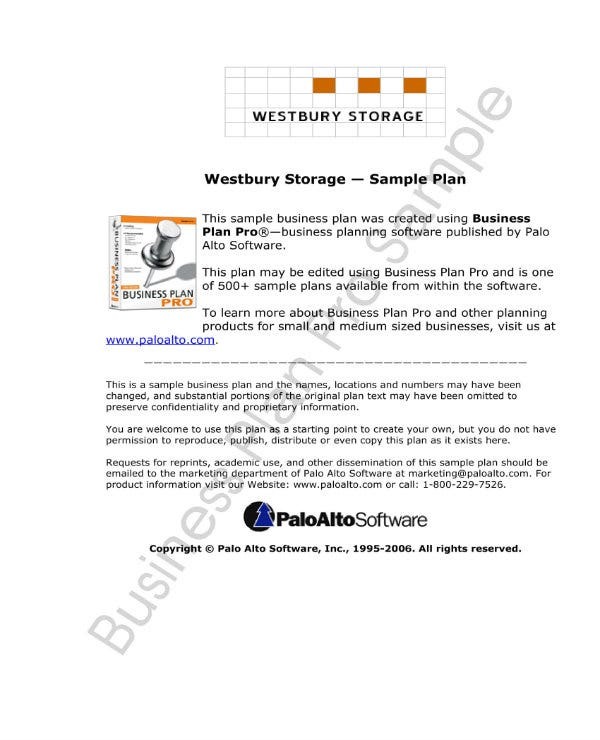 And with that in mind, here are the steps that will allow you to create a proper self-storage business plan. The first step when coming up with the business plan is to know exactly what your mission statement and vision statement is supposed to be. It’s very important that you know what they are as they will act as a sort of guide that will tell you what it is that your business has to do in order for it to be a success. So essentially, this section can be a useful tool that will allow you to create the right strategies that will help your business reach where it needs to be. So first, start out with writing your sample mission statement. You basically want to answer one question: What is is that you want your self-storage business to be able to do. The most obvious objective is to provide all clients with safe and secure storage spaces that can properly house whatever they decide to place in them. If you plan on using that as your main objective then simply reword it to make it your own. If you have other goals in mind? Then simply write it down in the business plan, but just make sure that it’s still in line with preserving the items of your clients. Then you will have to come up with your vision statement. Think, how do you see your business in the future? What kind of success is it supposed to reach in a couple of years time? Once you’re able to answer both questions, you’ve essentially attained your vision for your self-storage business. All you have to do now is right it down into the sample business plan. That will give both you and your employees something to look forward to and work towards. As you’re writing both of them down, just make sure that you’re able to do so in a detailed manner. Explain your mission and vision statements as clear as possible so that it will be easy for anyone to read and understand. You may also see startup business plans. If you’re going to set-up this type of business, then it’s important that you figure out who you’ll want to do business with a lot. These people are going to be your target audience and you want to make sure that you cater to their wants and needs. You may also see non-profit business plans. So think, who’s going to avail your storage spaces? Is it going to be businessmen who have to store their documents and files? Or maybe it’s tenants who will be storing whatever items they might have? Figure this out and write it down in the plan. You may also see business plan in word. Before anyone is able to avail your storage spaces, you have to be able to point out what it is that they can and cannot do with them should they decide to lease any out. This is where you will need to come up with rules and regulations regarding how these spaces should be used. This is to ensure that your business is protected from anyone that could use these storage spaces in a manner that could potentially damage your business’s image and reputation. You may also see business plan guidelines. It’s always best to come up with a list of what you prohibit rather than what you allow as you just want these people to store whatever they want, so long as it’s in accordance with the law and that they don’t get your business into any trouble. Think about these items thoroughly before writing them down and prohibiting your clients from storing them in your spaces. Just make your policies clear regarding how the spaces should be used and you shouldn’t have any issues. You may also read marketing consulting business plan. At this point, you should be explaining what it is that your business is going to need in order for it to operate as well as how much everything is going to cost. Make sure that you’re very specific when you’re listing down all of the different items that you’re going to need. You may also see market analysis business plans. Make a list of all the things like the different equipment, tools and even the storage spaces you’re going to need. Then once that’s done, you list down the amount of expense that will be incurred for all the items. Take note of how much it will cost to buy or rent what you need, as well as the fees you’re going to have to pay in order to run your operations. You may also see business operational plans. When you’ve pointed out how your storage spaces should be used, the next step is to come with the strategies that will allow you to market your business to your target audience. You’re going to have to think of the best ways that will gain the interest and attract your target audience so that you can engage and retain them. So you’ll need to use the information on the people that you want to be marketing to. You need to think about the best media channels that will allow you to easily communicate with the people that you want to do business with. You’ll need to think if you should go with social media, television, radio or whatever media channel you think you should focus your marketing strategies on. And once you’ve done that, then the next thing is to come up with the promotional material. While the promotional material must contain the basic information of what it is that your business offers and how much your customers will want to pay for it, you should also include other things that they want to hear. Share with them about what they can possibly store and where your business is located. When you’re done with writing everything in the plan, then the last step is to come up with the executive summary. It’s exactly what you think it is, it’s a brief summary of all the information that you have written down in your plan. Remember that’s everything from what services your business offers, how you’re going to marker it, how much it will take to start in and so on. If you want to learn how to create other types of business plans, then it’s best that you go through our site. You should be able to find the articles that you’re going to need that should be able to help you. Just make sure that your read these articles thoroughly so that you can make the most out of whatever information they have to offer.